The New Social Worker Online Blog: Ever feel like giving up? DID YOU EVER just want to quit? Today I felt defeated. Nothing horrible happened. In fact, I think I aced an exam this morning, and I am on target with all of my assignments. I am so close to graduation. This has to be normal. Tell me it's happened to you, too. Please. Will I miss this? The papers, the internship, the assignments, my classmates, my profs? I remember when I was an undergrad (a million years ago) and people would say, "These are the best years of your life. Enjoy them." Did you ever notice that people don't really say that about graduate school? When I mention I am getting my Master's degree, they usually say things like, "Wow, that's great. I could never do that." One woman told me she would not have made it through her residency without lots of bags of Cheetos. My classmates say things like, "We just gotta get through it." I feel confidant that this too shall pass. In the meantime, I'd love to hear about your struggles ... and your triumphs over difficulties while in school. Yeah I've had that feeling several times. Part of why I started seeing a counselor last year to have a 3rd party say "yep, you're normal". It will pass and you'll have just one semester to go soon! And thank you, Oretha, for reminding me who my readers are. I would never want to discourage anyone from getting their MSW. I applaud you for taking this important step in your life. Is it easy? Nope. If it was, everybody would get a Master's degree. Is it worth it? Absolutely! Would I do it all over again? Yes, I would. I've yet to hit a significant struggling point, but I do have people in my cohort that are struggling. I just heard from one last night that was a close friend's intervention away from seriously quitting. I'm still struggling with scheduling, but things are going along alright. I'm very glad I don't have to work while I'm doing this. It's good to hear from you, antiSWer. How long have you been in graduate school? One interesting thing that I lked about this article is that One woman would not have made it through her residency without lots of bags of Cheetos. Thanks for sharing such great article here. I can't tell you how many times I went to my husband during my schooling (including a diploma, a BSW and an MSW) and told my husband that's it, I'm quitting, going back to being a secretary. Whereupon he would make me a cup of tea, give me a hug and tell me to continue work on the paper tomorrow aftrer a good night's sleep. It always worked. Yes it is difficult. Yes, you will miss the people you are working with now, but will make new friends at your new job. Hang in there! Have a hot bath, a cup of tea (or whatever your calming, soothing drink of choice is), go to bed early. Tomorrow it will all seem much better. 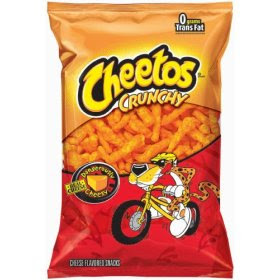 mmm, crunchy cheetos...that's what I'm missing! I was never a big Cheetos fan myself, but I'll try anything once! Thank you for your blog and words. Today is the first time all semester I truly feel all of the pressure/ exhaustion /responsibilities/ work/ and stress that I am under and I am the breaking point. This is inevitable for me every semester where life becomes so overwhelming imagining myself handling everything on my plate is ludacris. I know that tomorrow is another day and for me I need to get to this point becuase sometimes, for one moment, just saying to myself I just cant...and for that to be okay. Tomorrow I will wake up anew and know that I can, I can manage the papers, research, literature reviews, clients, second jobs, family pressure becuase that is what we do as graduate students and social workers...perservere! Reading your words was a comfort to me and I just wanted to say thank you. As I head into the final work of the semester, and it can feel daunting, I promise to take care of myself. That means getting enough rest, enough exercise and having a bit of fun, too. I hope you will do the same, AK-SW. I hear your words and they are a comfort to me, also. Let's hang in there together, okay?